This Forum brought together a diverse group of approximately 60 participants from 26 countries representing government, civil society, the private sector. 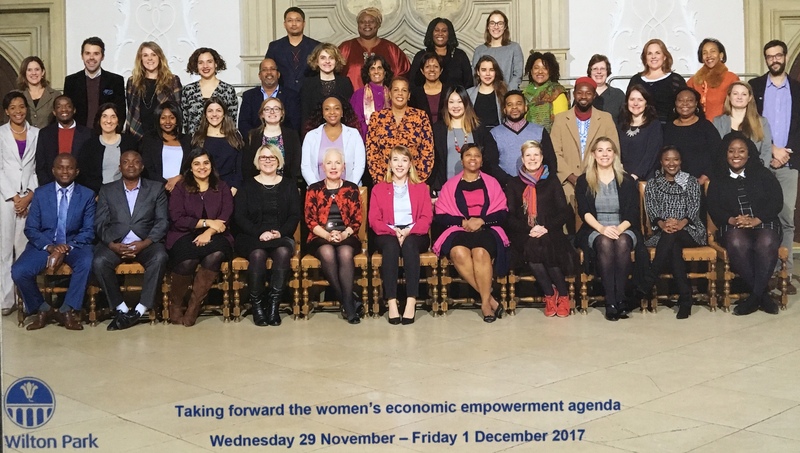 This Taking Forward the Women’s Economic Empowerment Agenda Forum was organized as part of our collective, ongoing response to the call to action issued by the United Nations Secretary-General’s High-Level Panel on Women’s Economic Empowerment in September 2016 and March 2017. The care economy and domestic work – recognizing, reducing, and re-distributing unpaid work and care. The discussions in the plenary sessions and the breakout groups were impassioned, frank and robust. We started in the first plenary by sharing our thoughts on what women’s economic empowerment means and why it is important. 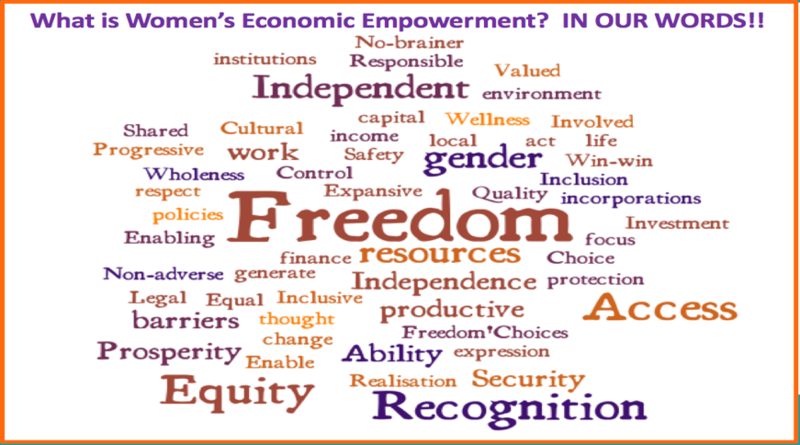 The word map below captures elements of the meaning of women’s economic empowerment, as we discussed and defined it. We agreed that women’s economic empowerment is not simply a homogeneous “women’s” issue. Moreover, the systemic barriers and persistent gender negatively impact women’s economic activity globally, in developed and developing economies. The evidence makes it clear that empowering women will benefit all in our societies in the developed, transitioning and developing world – men, women, boys and girls. It is an ‘economic no-brainer’ and essential for sustainable development and poverty alleviation globally. It is a win-win for all. Therefore, we agreed that in taking the agenda forward it is necessary to mobilize and engage all constituencies, including male champions, youth partners, and economic actors in the formal and informal economies. These constituent groups were well represented and made their voices heard in every facet of our discussions. One male champion shared that this goal for attending the meeting was to learn. However, by the end of the meeting he had re-focused his goal to ‘learn and un-learn’ recognizing that he has an important responsibility to advocate for changes in norms that negatively impact women and commit to taking action within his personal and professional networks. Another male champion shared his personal story in explaining why he was committed to building school toilets to provide sanitation and safety to help improve school attendance for girls. Yet another male champion shared his story about being raised by a single mother and recognizing the need for men to have more women as mentors and role models. The youth representation and perspective was brought into focus from the outset with a vigorous debate on the apparently favorable perceptions youth about gender roles and economic opportunity and the need to recognize the life cycle implications for women’s economic empowerment. This debate was triggered by the presentation of the International Youth Foundation’s Global Youth Wellbeing Index and the contributions of the three Chevening Scholars who were declared winners of the #Engage and Change competition. 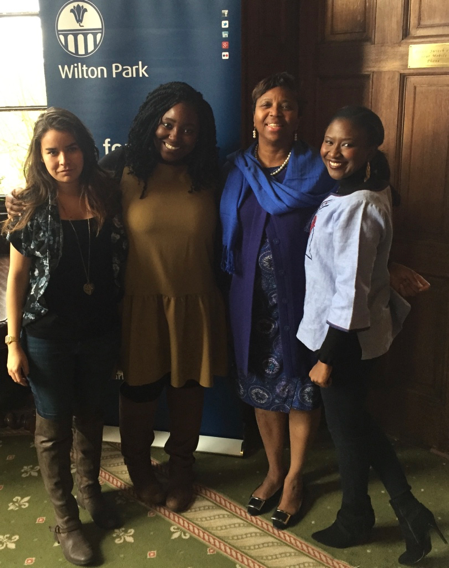 We also heard the powerful and moving personal story of a domestic worker. Shirley Price is an acclaimed champion for the rights of domestic workers globally and the Domestic Workers Convention, 2011 (No. 189). The personal – resolving to engage in difficult family conversations to challenge cultural practices that exploit disadvantaged young girls and boys in domestic servitude. The institutional – championing policy changes and government budget allocations to support women’s economic empowerment initiatives and changing the gender representation and culture within institutions. The substantive – advocating for more governments to adopt and implement the Domestic Workers Convention. The power of story – powerful narratives that challenge norms, promote understanding and change, and provide healthier role models for girls and boys – “You cannot be what you cannot see”. The power and responsibility of the individual in promoting changes in behaviors and perceptions of women as economic actors and gender roles in family care. The need to think disruptively and leverage technology in designing and implementing innovative solutions to expand and deepen financial and digital access. The need for more and better quality data – quality data and evidence are critical for policy making and implementation, performance monitoring, and impact assessment to improve efficiency, transparency and quality, beneficial outcomes for all. In our closing session, we made a collective commitment to building a platform to “connect and mobilize in order to achieve transformative changes, concrete outcomes and impact in advancing women’s economic empowerment” #WEIforwardWP60.